Do you remember, in the days before the supermarkets took over and provided all our Christmas requirements, that there were recipes within the family passed down from generation to generation? When I was a child, with a younger brother and three young boy cousins, we would all enjoy a glass of ginger wine in a small sherry schooner at Christmas time. My cousins were so young they could not get their tongues round what to them was a very new word ‘wine’ and they would pronounce it ginger ‘wiyerne’ as they lined up eagerly to try it. The process would start with a rather dog-eared piece of paper, with the recipe written on it, being taken to Boots the chemist and a small bottle of dark brown, thick, syrupy and pungent liquid would be brought home. This was added to boiling water and sugar and finished off with a small glass of dark rum usually from a miniature purchased for the purpose. 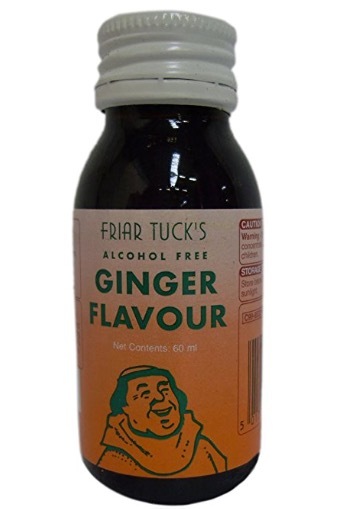 Eventually the chemists discontinued making up these concoctions but luckily they decided to stock Friar Tuck’s Ginger Flavour essence instead, which made a good substitute, and so the tradition continued in the family. When my husband appeared on the scene in the mid 1960s he really redeemed himself, with the family he would eventually marry into, by winning a bottle of Captain Morgan’s dark rum in a pub raffle, which went on to enhance many a batch of ginger wine. 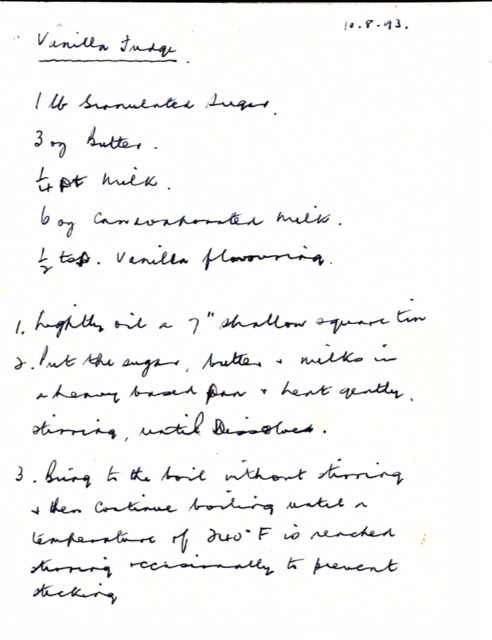 I do not have a copy of the original recipe, which saddens me, but I do have a copy of the other Christmas family favourite which was the fudge that my dad used to make and I cherish a handwritten copy of his original recipe. While the fudge was boiling on the stove I would be allowed to clean out the condensed milk tin with a teaspoon and I can still remember the lovely smell that would pass through the house and the agony of waiting for the fudge to cool and set before we were allowed to try a piece. 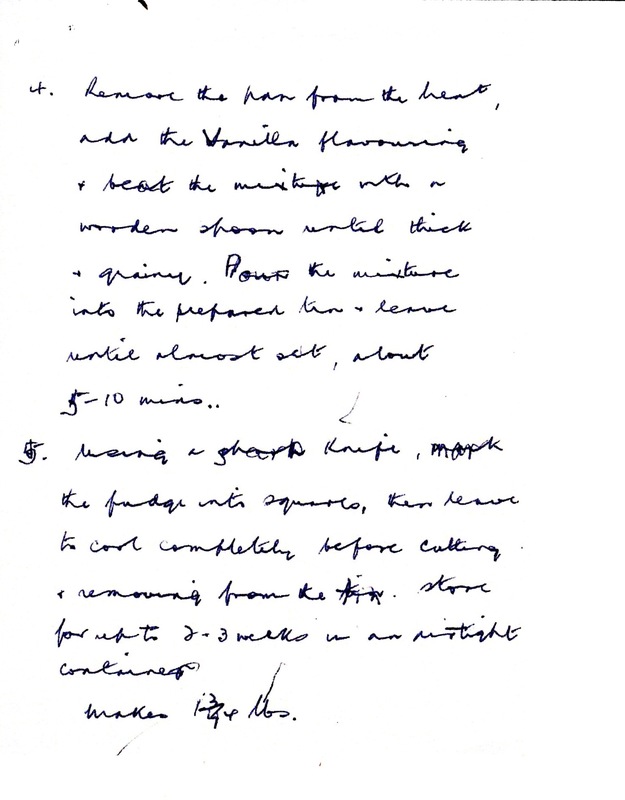 When he wrote out the recipe in 1993 he had progressed to using a thermometer and I love the fact he wrote, hopefully, ‘store in an airtight tin for up to 2-3 weeks”! I hope these memories will prompt you to stop for a moment, amid the hustle and bustle of your preparations, to cast your mind back to your own family Christmas favourites, and share them with us. This entry was posted in Uncategorized and tagged Christmas, Friar Tuck's Ginger Flavour, Fudge, Ginger wine. Bookmark the permalink. This made me smile, I am just checking the recipe for sausage stuffing from a very old and tatty cook book, my Mum and Dad had as a wedding present in 1955, I think the page has 60 plus years of stuffing on it! My mother once made some beetroot wine and didn’t realise how alcoholic it was. She gave it to me and a friend to try one lunchtime and we reeled back to school for the afternoon! My family also toasted Christmas every year with Stone’s Ginger Wine and I still do… a glass with a minced pie 🙂 Happy Christmas to you and yours!